Brand new on the Capitol/EMI label, Ringo Starr’s Liverpool 8 is bound to create a few waves – or at least some ripples – because it’s not only receiving some extensive promotions, but is also being marketed in a number of ways. Available January 15th, it’s being released not only as a CD (or as digital downloads), but also as a pre-loaded USB wristband that includes video features, ring-tones, and photos. The album is also being tied in with a concert in Liverpool, radio and TV features, and other promotional activities, including special deals with everyone from Amazon to VH1. And of course, advance copies have been sent to music critics, which is where I come into the picture. It goes without saying (a phrase that’s always followed by saying it anyway) that you can’t talk about Ringo without mentioning the Beatles. But everybody knows the history of the group and where Ringo fits into it, so I’m not going to go over all that again. I didn’t find the title song particularly engaging but it does have some curiosity value, I suppose. Some of the other tracks did a better job of hitting the target with me. Among them were “Now That She’s Gone Away,” with a solid vocal from Ringo accompanied by a driving beat. Although he has a rather straightforward and unremarkable baritone, he does occasionally coax forth something a little different, and that variety helps sell that and other songs. I had a couple of favorites besides those already mentioned. One was “Harry’s Song,” which has an unusual opening but then shifts gears and turns into a tune that includes a little bit of everything, including an echo and whistling. (Trust me — it sounds better than it describes.) I also found the closing track, “R U Ready,” delightfully playful and the perfect finish to an album that surprised me with it’s diversity. 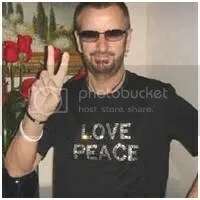 Clips will be available at Ringo’s Website or Ringo’s Myspace. Well, I for one happened to LOVE the title song. Maybe because I have been a loyal Beatles fan for a VERY long time and this song brings me back to the days of sitting with my girlfriends and screaming for Paul, the cute one and George…my favorite. Guess that is what makes music so special, means something different to each one of us. You are exactly right, Carol — music is special to each of us in different ways. Thanks for writing.